It's Just Mobolaji | Music & Entertainment: Kabuuki Dust Presents: ‘Santa Hats & SnapBacks!’ @ Juno Bar, Dec 21st! 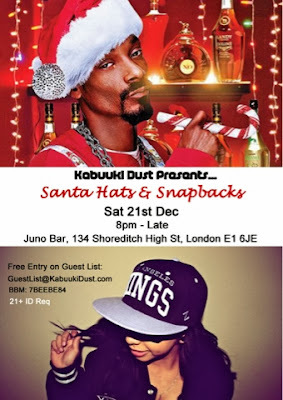 Kabuuki Dust Presents: ‘Santa Hats & SnapBacks!’ @ Juno Bar, Dec 21st! Looking for a good way to kick off your Christmas Holidays in London? Then look no further - Kabuuki Dust have got that sorted for you! The festive celebrations are kicking in, in London and Kabuuki Dust are hosting their own Christmas party at the popular Juno Bar in Shoreditch. Following a hugely successful All-Moustache Movember party; the dress-code theme this time will be a combination of Santa Hats and Snapbacks which will represent the Christmas spirit and accompany the immense beats that will be dropped - a mega mix of Trap, Deep House, Hip-hop, Bashment. There will also be surprise Christmas giveaways including Free Santa Hats for All plus Happy Hour drink deals!